Today at MWC 2018, Nokia has brought back the legendary 8110. Hidden underneath that iconic curved design, the 8110 is packing modern necessities, like 4G. The Nokia 8110 gives you the perfect chance to switch off and relax with the knowledge that all your smartphone essentials, like Google apps, are there when you need them. Nokia 8110 comes with the build quality you'd expect from a Nokia phone, delivering durability and reliability as standard. The handset delivers VoLTE calling, and a familiar and easy to use interface, such as slide to answer and end calls, as well as an addictive helicopter style spin on its axis. The 8110 also has an app store, which gives access to favourites like Google Assistant, Google Search, Google Maps, Facebook and Twitter. You'll also be able to send and receive emails or import your contacts and sync your calendar with Outlook and Gmail. To keep it running flawlessly, the Nokia 8110 features the Qualcomm 205 Mobile Platform. And yes, before you ask, it comes with a revamped version of Snake. 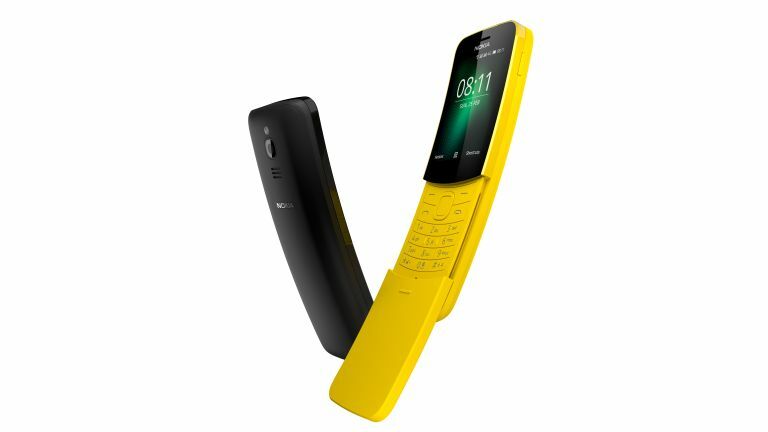 The handset is available in Traditional Black and Banana Yellow. It will be available from May and will retail for a global average retail price of €79 (around £70), excluding taxes and subsidies.